Hardie, Burns and other great icons of the early UK Labour movement must be roasted to a frazzle in their non-conformist graves. For it is a Labour government (say it again with Kinnock v. Hatton emphasis, "a Labour government...") which has allowed Britain to share the joy of super-casinos  open 24 hours a day and boasting 1,250 jackpot gaming machines. It was Harold Wilson who suggested the Labour movement owed more to Methodism than Marx – but, thanks to Tessa Jowell's gambling act, casino culture is here to stay, in spite of strong protests from all Christian traditions. 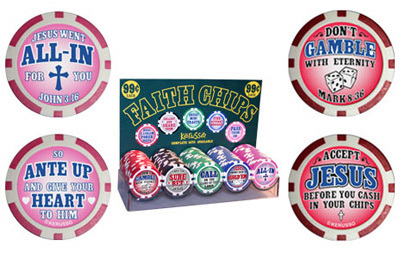 So, using the if-you-can't-beat-them-convert-them argument, let's all celebrate the imminent spread of gambling addiction, broken families and debt-driven suicide by buying these sanctified poker chips. If you've still got $0.99 left, that's all "Don't Gamble With Eternity" will cost you. Thanks to Louise for finding this gadget.